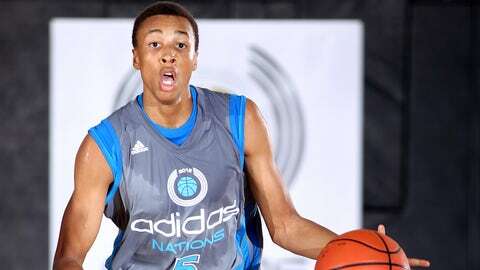 Dante Exum has jaws dropping on multiple continents, and should be a very rich teen come summer. While the pro-basketball world waits for Andrew Wiggins, Jabari Parker, Marcus Smart & Co. to finish their college seasons and decide on their 2014 summer plans, one player on the other side of the planet made the June NBA Draft a lot more interesting on Tuesday. Australian 18-year-old Dante Exum declared for the draft through a statement with his parents to ESPN, hiring agents Rob Pelinka and Brandon Rosenthal of Landmark Sports Agency. While not carrying the fanfare of name recognition of his NCAA counterparts in the United States, Exum is considered by most the top point guard prospect (or in close competition with Oklahoma State’s Smart) and a likely top-five pick. The 6-foot-6, 190-pound Exum opened eyes with a strong showing at a Nike camp in April, then followed that up with a strong run in the FIBA U-19 championships over the summer, dropping 33 points on Spain in the quarterfinals and 28 on Lithuania in the bronze-medal game. Exum told a radio station he is not currently playing, and plans on heading to the US soon to begin training in preparation for the draft. Of course, whatever the Lakers can do, the Celtics . . .